Countries like Pakistan always appear at the global stage to be battling big challenges such as political crises, conflicts and disasters. But the picture remains incomplete without seeing challenges of a different kind that ordinary people, particularly the poorest, face on a daily basis. Research conducted in Pakistan, alongside nine other developing countries, for the Life in a Time of Food Price Volatility project provides just such a perspective. Qualitative research was carried out by the Collective for Social Science Research in 2012 and 2013 in a cluster of villages in Dadu district and in an urban working-class neighbourhood in Karachi to explore how rising food prices were affecting the poor. Three important themes emerged from our research in Pakistan which helps understand ways in which food inflation impacts the poor and the vulnerable. Survival strategies of the poorest are centred on acquiring staple food to avoid hunger. In the Dadu villages, where wheat is the only major crop these strategies revolved around the crop cycle. During harvest, activities of all the households are around acquisition of wheat either directly through agricultural labour or indirectly by providing other services in exchange for grain. The wheat is stored and consumed over several months and is also used as a currency to purchase other goods and services. For the urban poor, who engage in a range of activities including petty vending, wage labour and begging, the main priority is to acquire sufficient amounts of wheat flour or bread to fill their bellies. Many of the poorest work, borrow, or beg to ensure that they have just enough to eat, regardless of prices and wages, and they generally only scrape by. For the rural poor, wheat prices matters little because their annual cycle is focused on acquiring a target quantity of grain. Money, therefore, is almost incidental in these survival strategies which combine remunerative economic activity with borrowing and begging to stave off hunger. Support from informal institutions reduce a poor household’s dependence on market denominated transactions and instead increase their reliance on other households and individuals. Of course these social arrangements, which might protect individuals from prolonged periods of hunger, come at a social cost in the form of humiliation and loss of respect. Food is circulated in a community though reciprocal exchanges between neighbours and family, regular charity by somewhat better-off households and individuals (who may themselves be poor in the wider scheme of things) and through begging by those entirely dependent on alms for survival. These various forms of non-monetised food transfers often occur in overlapping layers. Reciprocal gift exchange might be extended to one-sided support for some time, and people who might accept charitable donations on religious occasions might sometimes beg outright. For people on the margins, the household or the basic social arrangement for cohabitation and joint consumption also has fluid boundaries. While ‘normal’ households are often identified as the unit that shares regular meals among its members, we found diverse arrangements in place which ensure the sustenance of individuals. For example, children are easily able to go their neighbours or relatives to eat when there is not enough food in their own home. An adult woman doing domestic work might count on eating lunch at her employers’ house, and then coming home to prepare a meal for other family members. Households break down under conditions of stress, and often the first sign of male household members leaving is them not eating meals with the rest of the family. The longitudinal design of the study enabled us to survey the same households in two different years providing rich data on the changes experienced by the household over the year. We were able to identify conspicuous changes that a household undergoes such as variations in its earning potential and livelihood, alternation in its size and composition, and conflicts within, which are sources of positive as well as negative shocks. For instance, the social and economic condition of one respondent improved after her husband got a job in the police while another respondent’s husband had to give up his rickshaw, the main source of their earnings due to his inability to meet rental payments. 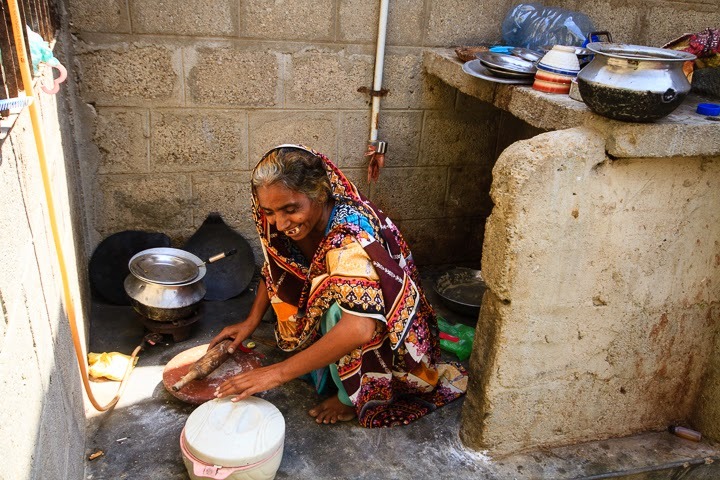 One of our case-study households, flood-affected migrants in Karachi, were evicted from their uncle’s house after a family dispute while another respondent, also a flood-affected migrant, who was initially living in a warehouse was joined by his family and had moved into a house. The severity of these events at the individual and household level appears to have more of an impact on people’s lives making the effect of inflation secondary. In-depth qualitative research provides insights into how the effects of macro-level changes such as inflation and government policies are experienced by poor individuals and households. In the third round of fieldwork, starting soon, we will re-visit our informants to see how their well-being has changed over the last year. We aim to go beyond the quantity of food consumed by asking informants about their perceptions of the quality of the food they consume and how consumption habits and food preferences change over time.